A good work of art does not provide answers; it poses questions and provokes. It begs to be analyzed through a dozen different lenses, from a dozen different angles. 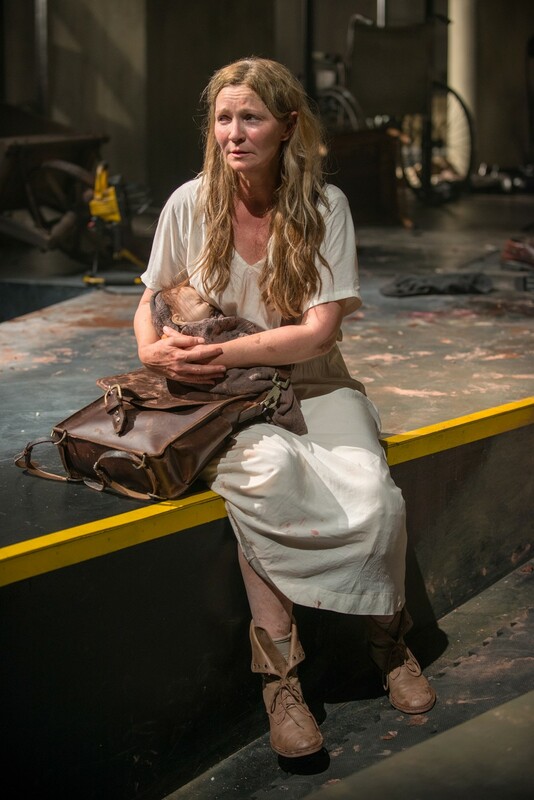 Fortunately, Steppenwolf’s uniquely staged American premiere of The Wheel does just these things, mostly thanks to Joan Allen, the production’s leading lady and a longtime ensemble member. Allen has spent the last two decades of her career on bigger stages and bigger screens. Though known to many as Pamela Landy from The Bourne Identity series, Allen has had years of experience beyond blockbusters. In 1996 her performance in Nixon earned her an Oscar nomination for Best Supporting Actress. She also won a Tony Award for her Broadway performance in Burn This. She returns to the Steppenwolf stage as the tough character Beatriz, who begins the story joyously preparing for her sister’s wedding in 19th century Spain. Beatriz takes it upon herself to care for a girl who is separated from her father when war breaks out. Things do not go as planned, though, and a greater journey begins. As she struggles forward, picking up other lost children, time races forward through World Wars I and II and the Vietnam War, with Beatriz at the center of it all alongside the mute and nameless girl, who begins to show strange powers. However, The Wheel offers much to think about beyond the basic plot summary. The play includes elements of magical realism. In this case, time travel connects events and ideas throughout history in an endless, repetitive cycle of war and conflict, and assists in developing complex, interwoven themes of war, good and evil, family, and morality through the allegory of Beatriz’s journey. Director Tina Landau initially hesitated to take on the script, written by British playwright Zinnie Harris, because of its density. As she delved into it, however, it became a challenge she was willing to face. Using a large cast of 17 people, live music, and wildly dynamic staging, she brought the story to life. Blythe R.D. Quinlan provides an inventive set that shifts before the audience’s eyes. It is created without backdrops on the exposed stage, and the actors move within the entire theatre, as if it were a continuation of their world. The lighting and sound effects, designed by Scott Zielinski and Kevin O’Donnell respectively, help to evoke the ideas of war with terrifying, visceral realism. The experience, in its entirety, is enthralling. The Wheel runs several layers deep with metaphor and allegory for us to digest, perhaps with great pains. It explores how humanity both reacts to and survives war and crisis. Allen is extraordinary, displaying humor and joy alongside fear and suffering. She is complemented by a talented supporting cast, great staging, and careful directing, but it’s ultimately her performance that captures and compels the audience, who cannot help but be dragged along on her journey and retrace it in their minds for days afterward. The Wheel is at Steppenwolf Theatre Company through November 10.